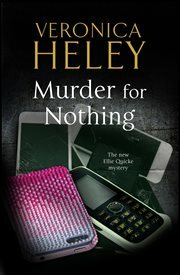 The item Murder for nothing : an Ellie Quicke mystery, Veronica Heley represents a specific, individual, material embodiment of a distinct intellectual or artistic creation found in Evansville Vanderburgh Public Library. "No good deed goes unpunished, as Ellie Quicke finds out in this engaging and entertaining mystery.Ellie Quicke believes in helping people in trouble. But it would appear that her latest good deed has returned to bite her when she takes in a weeping girl who needs somewhere to stay. Selfish, thoughtless and irresponsible, Angelica is by no means the easiest of house guests, confident that someone else will always pick up the bill. But when a dead body is found in the garden the morning after a riotous party she's organized, Angelica plunges Ellie's household into a situation too hot for any of them to handle.Selfish and thoughtless her guest may be, but Ellie does not believe Angelica is capable of murder. However, when she attempts to uncover the truth about what happened that night, Ellie unearths a series of disturbing revelations."